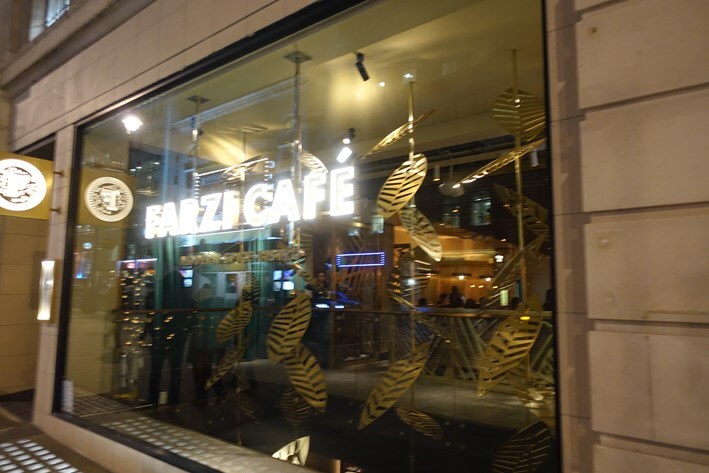 The newly opened Farzi Café in Haymarket is an offshoot of an Indian restaurant group called Massive Restaurants, founded in 2012 and now with over 30 restaurants with brands including Farzi Café, Masala Library and Made in Punjab, with outlets in India and the Middle East. 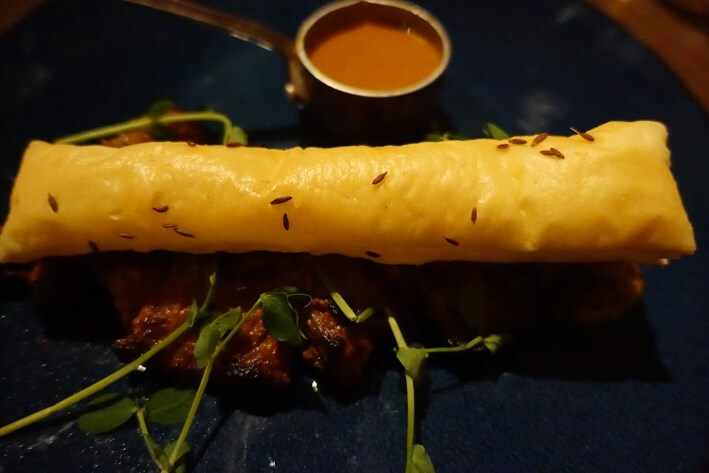 The food is very much modern Indian rather than traditional. Indeed the name itself “Farzi” means “fake”, indicating that the dishes are not all what they seem to be. The premises are at the bottom of Haymarket, spread over two floors. The main dining room is very smart, as well it might be given the £4 million investment that has been made. There is a partially open kitchen at the far end where the chefs appeared very calm despite this being just two weeks after opening and having a busy restaurant to cope with. 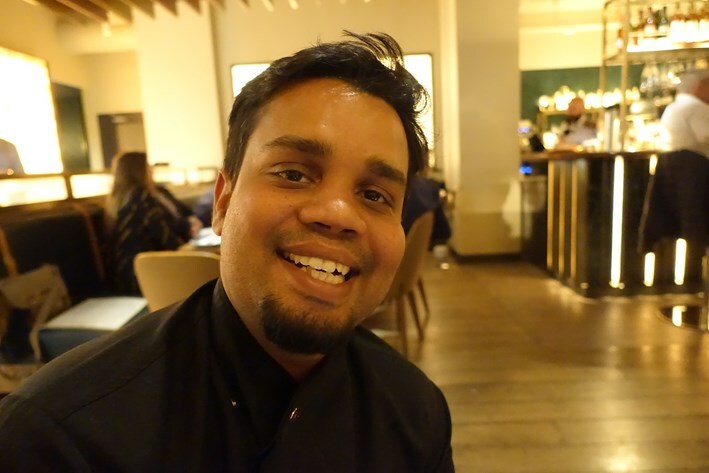 Behind the stoves, at least initially, is Saurabh Udinia, the executive head of the group, who has worked with the group since 2013, and prior to that worked at Indian Accent in Delhi.. He will in due course hand over to a head chef here when he returns to India. The wine list had 75 labels and started at £20, with a median price of £58. Wines were set out in a sequence mysterious to me that was not by price, grape or country. The list had just 32% red wines, which makes some sense since tannic red wines do not pair well with curry, but there were plenty of champagnes, which work just fine with spice, and a few Rieslings, which are an ideal foil for spice. There were just a couple of token dessert wines, and the grand marque champagnes like Cristal and Dom Perignon were lazily listed without their vintages, though at least most wines had their vintages properly shown. Sample references were Domaine Coudoulet Chardonnay 2017at £30 for a bottle that you can find in the high street for £12, Dog Point Sauvignon Blanc 2017 at £50 compared to its retail price of £18, and Au Bon Climat Pinot Gris 2016 at £60 for a wine that will set you back £18 in the high street. For those with the means there was Puligny Montrachet Les Folatieres Cahteau de Puligny Montrachet 2015 at £190 compared to its retail price of £91, and Chateau Calon-Segur 1996at £290 for a wine whose current market value is £161. The median markup level on the list was almost exactly 3 times retail price, which is not excessive by central London standards. There were a few relative bargains available e.g. Ruinart Blanc de Blancs Brut champagne at £95 compared to its retail price of £67. Alternatively, Cobra beer was £6 for a small bottle. 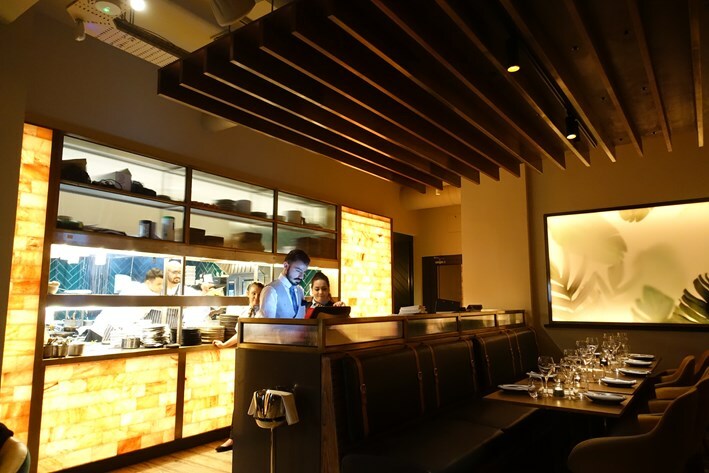 The menu has considerable choice, with “nano plates”, “small plates”, grills, main courses, side dishes and breads. 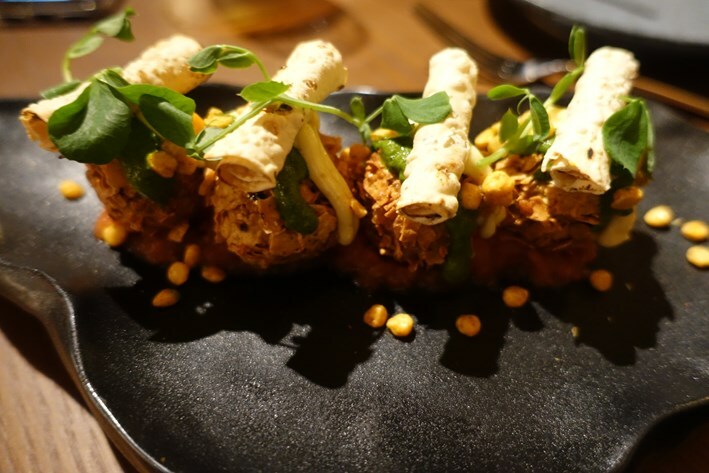 We were advised to order two small plates per person and then a main course, though in truth these small plates were starter sized, so one small plate each would be plenty given the generous portion size of the main courses. Dhal arancini with rolled popadoms worked well, the rice and lentils coated with crushed popadoms before being deep fried. These were tasty and unusual, a nice variant on the classic Italian rice ball recipe, and came with onion tomato salsa and mango pickle aoili (14/20). 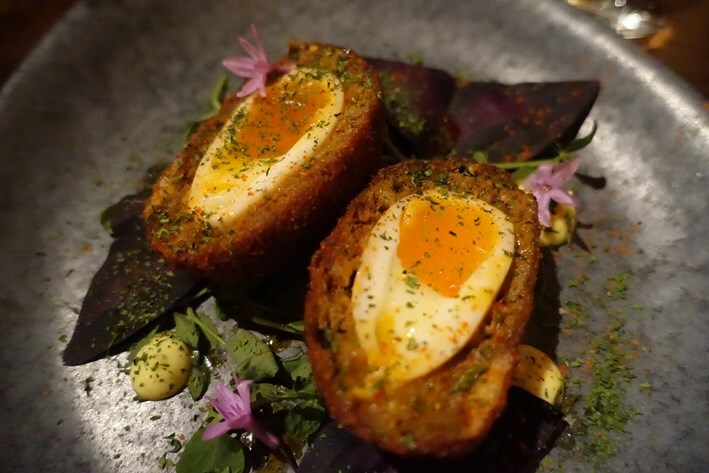 Beef Scotch eggs had liquid egg yolk centres and a beef sheek kebab filling that is then coated in breadcrumbs and deep-fried. This was served with chive hollandaise flavoured with smoked chilli oil (13/20). Amritsar fish and chips had on the side a “chukki” peas, i.e. peas mashed and flavoured with cumin and asafoetida, in place of traditional mushy peas. The fish was spiked with a mix of yellow chilli powder, dry mango powder, cumin, asafoetida and black salt. 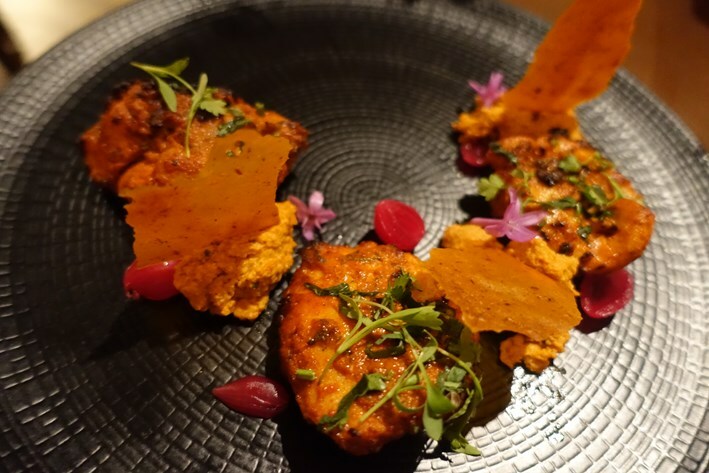 This masala mix was quite subtle and for me could have been more prominent, but the halibut itself was carefully cooked and the batter was light and delicate (14/20). Chicken tikka had three pieces of chicken in different textures. One was traditional, one was a pate and the other was crisp. All the variations worked well, and the meat had nicely absorbed the spices of its marinade before being cooked in the tandoor (15/20). 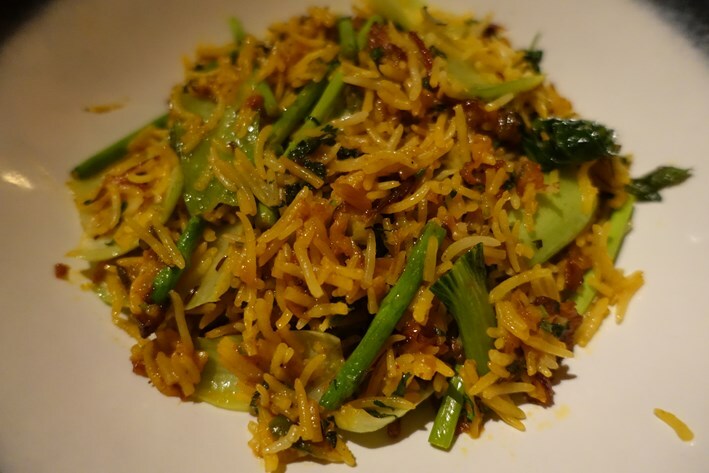 Biryani with baby asparagus and bak choi had fragrant rice and delicately cooked vegetables, the rice flavoured with mint, mace and cardamom, with a roasted garlic yoghurt raita on the side (14/20). 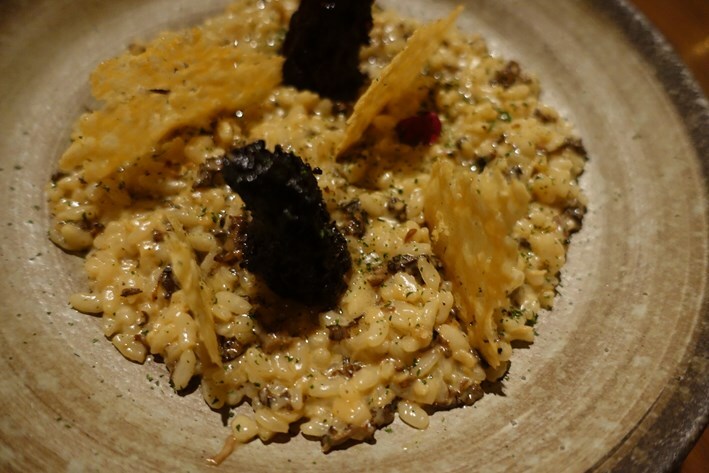 Kashmiri risotto with Parmesan crisps was a nicely made risotto with good texture. The stuffed morels were cooked in a tandoor though the link to India here seemed tenuous. It was a nice dish, I just didn’t quite understand why it was on this menu (14/20). 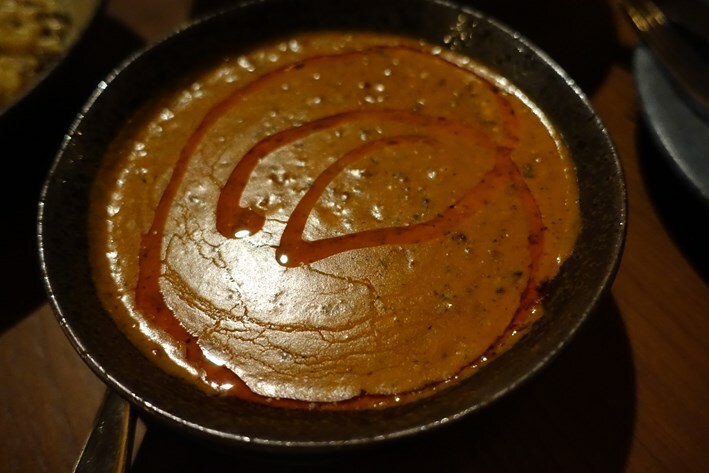 More traditional was a dhal makhani, with excellent texture and smoky flavour, as dark and brooding as Heathcliff in Wuthering Heights. The lentils were cooked for 24 hours, tempered with ginger, garlic, dried fenugreek leaves and tomatoes, and finished with butter and cream, This was the star dish of the night for me and showed real skill in the kitchen. I have had endless versions on makhani dhal over the years but only a handful in this league (16/20). A mixed bread basket had very good naan and paratha (14/20). 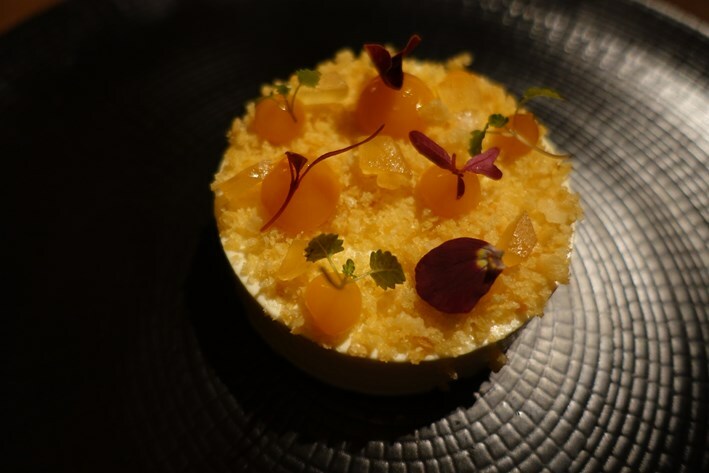 Shrikand cheesecake with mango coulis was unusual and interesting. Shrikand is a sweet from the western states of India made with strained yoghurt and flavoured with saffron and cardamom. I have not seen it used in a cheesecake but it worked very well. The finished produce had light texture, and the mango coulis provided a touch of acidity to cut through the richness (15/20). Service was good, the waiting staff being very attentive. The bill came to £80 a head with beer to drink, but we ended up over-ordering. 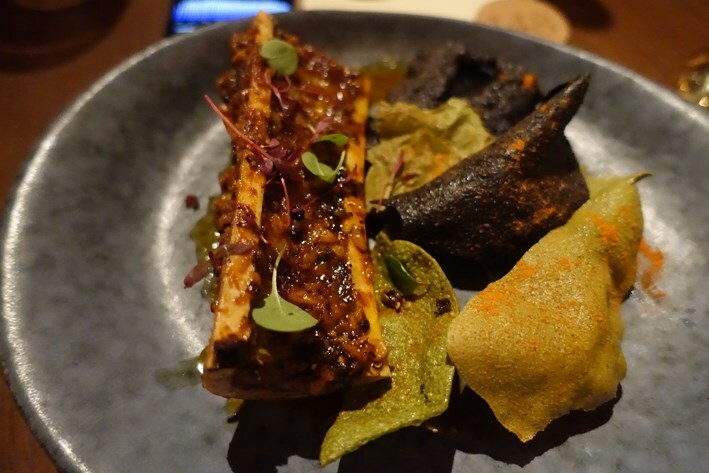 If you stuck to a small plate, main, side dish and shared a modest bottle of wine then you a more typical price per head of about £65, which is not bad given the smart surroundings, central location and capable cooking. Farzi Café was already very busy just two weeks after opening, even on a cold winter night in January, and I expect it to prosper.